The start of a new year is a great opportunity to revisit some of my revolvers that have largely remained unfired since I finished the S&W 66 Optic. After totally screwing up my last match of 2017, I decided to return to my first revolver, the Smith & Wesson 686-1. I shot an IDPA match the third week of January with this revolver and everything was alright...until the steel stage. 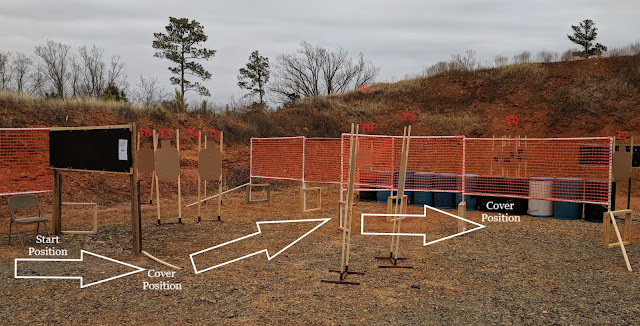 Rather than reliving that debacle, I will share my experience at the February 2018 IDPA match. Needless to say, this match went much smoother. It was a chilly Saturday morning on the range and the match director set up five short stages that we're completed before 1:00 p.m. Since last fall, I've spent most of my time shooting revolvers with red dots. This has made me extremely sloppy when shooting with iron sights. I realize that the red target labels are a bit difficult to see, especially with the orange clay in the background. I apologize for this oversight and will try a brighter color on the next match review. For those that don't typically shoot competitively, the various sports have different ways to determine a shooter's skill level, referred to as a "Classifier." IDPA recently introduced a new classifier that is five stings of five rounds, totaling 25 shots. A shooters raw time plus any points down or other penalties produces a total time that is compared to an established rubric. IDPA's current classification system is: Novice (NV), Marksman (MM), Sharp Shooter (SS), Expert (EX), and Master (MA). My first revolver classifier was back in April 2016. My time placed me on the lower end of the Marksman rubric. With the new classifier official in effect and the season just getting started, the MD decided that the first stage of this match should be the new classifier. 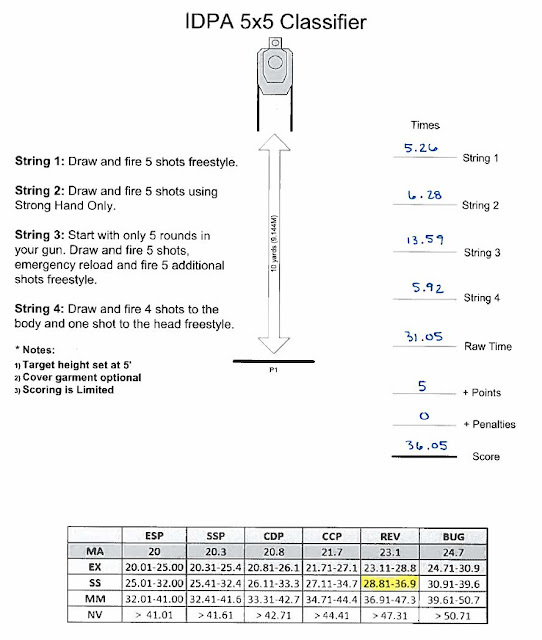 At sign up, shooters could elect to have their scores submitted to IDPA as a classifier. I was in need of another REV division classifier, so I requested my scores to be sent. I bobbled the reload slightly on string three and only shot five points down total. I finally bumped into Sharp Shooter with an overall time of 36.05! All in all, I'd say the stage went well for me. Stage two required a seated start. Shooters began holding a large rock that was supposed to be a phone. At the buzzer, the "phone" was discarded and T1 and T2 were engaged on the move to the first cover position. Once in cover, T3 - T6 needed to be engaged while slicing the pie. Shooters then moved toward the targets obscured by the vision barriers, that felt like a hallway. The stage description required T7 and T8 to be engaged before T9. T9 was surrounded by Non-Threats with only the head visible. 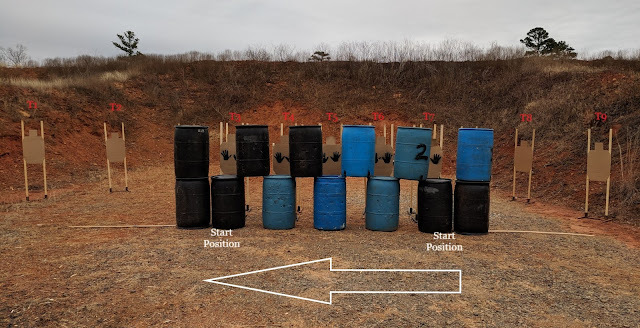 While there was no cover position at the barrels, EVERYONE kneeled in the same spot to avoid a shoot through on the Non-Threat. I loaded and made ready before being presented the latest "phone-rock hybrid". At the buzzer, I discarded the worthless technology and engaged T1 and T2. At the only official cover position, I engaged T3 and performed a solid reload. T4 - T6 ran the wheel gun dry again and I bobbled my reload on the way through the vision barrier tunnel. I engaged T7 first and then T8 while moving to "the spot." I placed two down zero shots on T9 without striking a Non-Threat. I finished this stage in 29.85 seconds with no points down. This stage was borrowed from Silver Dollar 2016 but treated barrels as vision barriers. The MD has participated in several large matches and likes to hit us with his favorites from time to time. This stage was apparently borrowed from the 2016 Silver Dollar Match but adjusted to fit IDPA's current rules regarding fault lines and vision barriers. Shooters had the option to start at either position. T3 - T7 all had no shoots directly in front of them, so shooters engaged targets diagonally from their current position. T1 and T2, much like T9 and T8, were engaged second and third. This is because T4 and T6 were visible from their respective side's start position. Interesting, right? After engaging T4, followed by T1 - T3, shooters continued shooting targets as they appeared, reloading as necessary. As most of the shooters were right handed, they chose to move from left to right. The two lefties, myself and another shooter in competing in CDP, chose to move from right to left. I drew and engaged T6 before taking two steps to the right to shoot T9 and T8. With the revolver empty, I reloaded and addressed T7. I started moving down the line shooting each target as it appeared in front of my sights. A couple shooters bumped their muzzles on the barrels because they crowded cover. I managed to avoid that. When it was all over, I finished this stage in 29.66 seconds clean. The tactical broom was later replaced with a tactical stick. 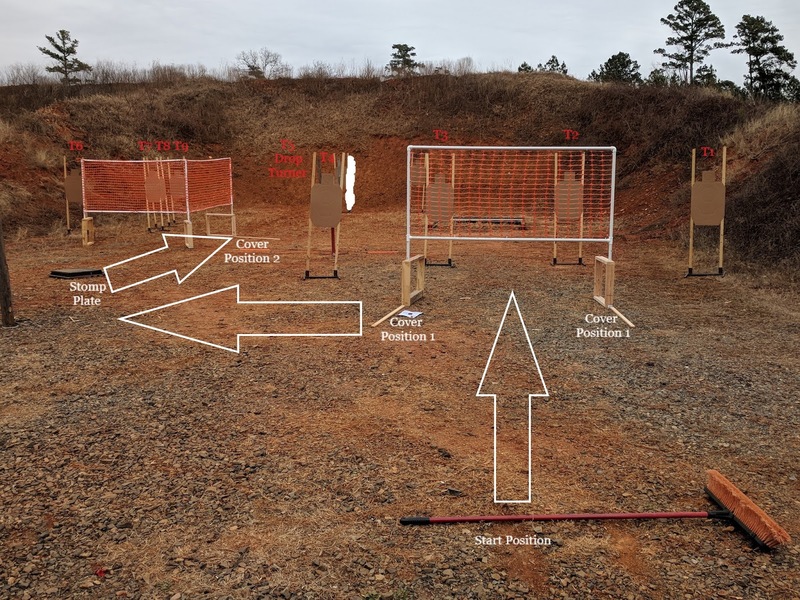 This stage was designed by the MD's preteen daughter who has just started shooting matches with our club. At the buzzer, T1 and T4 become visible and must be engaged on the move to the first cover position. Once in cover, T2 and T3 must be engaged before a shooter proceeds to the next array. 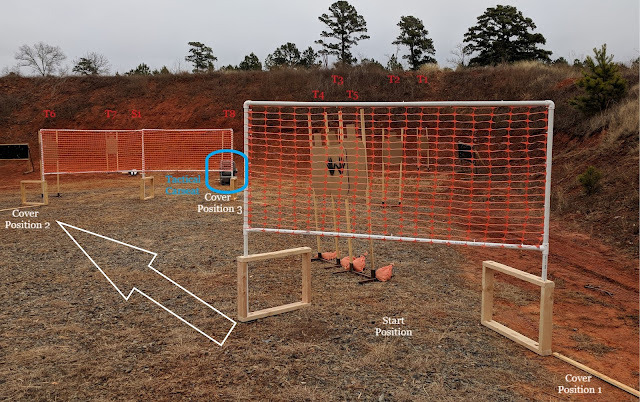 After leaving cover and heading toward the stomp plate to activate T5, T6 becomes an appearing target before shooters reach the plate. After engaging T6, shooters activate the stomp plate to reveal T5. Shooters move to Cover Position 2 to engage T7 - T9. She did a great job with the design! While advancing to cover, I addressed T4 first and then T1. From the right side of CP1, I engaged T2 and performed a reload while moving to the left side of CP1. Two quick shots on T3, one of them down one, and I was off headed toward the stomp plate. T6 became visible and I fired four shots to empty the revolver. I should have shot three on T3 and three on T6, but I figured four shots on a target while on the move was a safer bet. I bobbled the reload at the stomp plate, landed two shots down zero on the drop turner. At CP2, T7 and T8 were shot before my final reload. I dropped a point on T9. I finished this stage down two points in 31.25 seconds. Note the tactical car seat. It had several holes by the end of the day. This was the final stage of the day for my squad! There was quite a bit of movement between Cover Positions 1, 2, and 3. At the buzzer, shooters moved to CP1 and engaged targets while slicing the pie. Target 1 was 20 yards away, T2 was half that distance, but T3 was the furthest away. To increase the difficulty, the target hung partially obscured by a Non-Threat target. T4 and T5 were treated as appearing targets and everyone addressed these on the way to CP2. T6 and T7 were both visible from CP2 and were required to be engaged from that position. The steel popper, which activated a rising target, was engaged from that position or CP3. From CP3, shooters could make up any misses on T1 and T3. T1 and T2 were both down one point. I aimed high right to avoid the Non-Threat on T3. I reloaded and shot T4 and T5 twice on the move, dropping another point on T5. I rushed the trigger press on the second shot. Once I entered CP2, I engaged T6 before reloading again. With a full cylinder, I shot T7 and ran to CP3. From CP3, a single shot downed the steel which fell and triggered the disappearing target T8. I shot it twice before reviewing T3. I couldn't see the hits until I reached the final position. I was actually down 8 points, so I reengaged it with my final shot in the cylinder. I should have shot the steel at CP2 then scurried over to CP3 before T8 rose and fell, but I was afraid of the timing. I totally could have made it! I finished this stage 8 points down in 36.19 seconds. This was a great match! I still didn't do great, finishing 27th out of 36 shooters, but I was the only revolver shooter again. 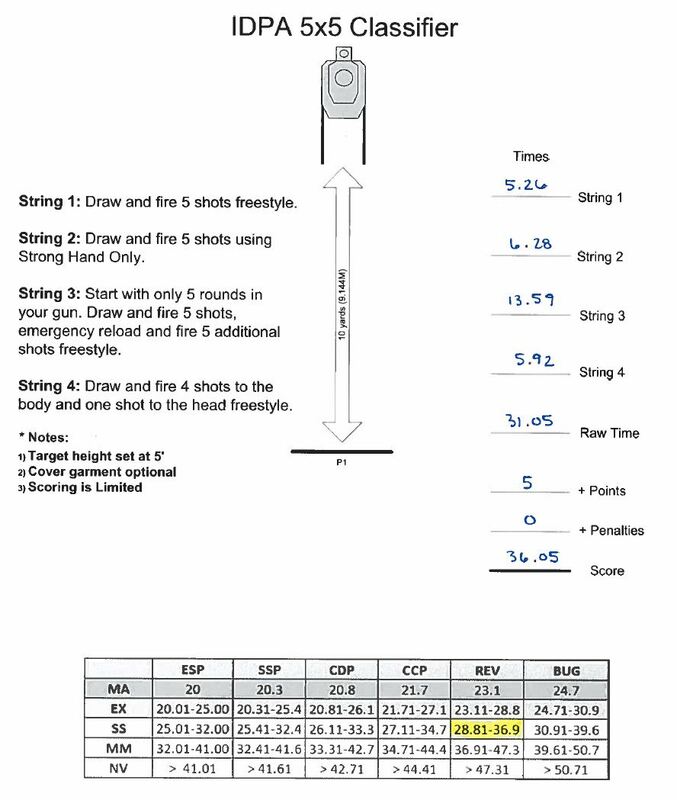 I feel like five stages is the perfect number for an IDPA match that starts at 10:00 a.m. One standards stage can assess skill, while four 18 round stages test both efficiency of movement and reload speed. I am still bobbling a reload with my Safariland Comp III speed loaders at least once per stage. I've found the issue to be my initial grip of the loader. If my index finger lands on top of a round, I tend to align the bullets with the chambers faster. I plan to focus more on the position of my hand when I go for a speed loader. So what is next for my IDPA journey? Well, now that I have another valid classifier under my belt, I plan to shoot a Tier 2 match in Summer 2018. In the mean time, I will return to the S&W 66 Optic now that IDPA has produced provisional rules for the Carry Optics Division. Just like USPSA's similar division, revolvers sporting a red dot have been left out of contention. Luckily, that doesn't stop me from shooting in the Specialty Division and comparing my scores with the other red dot equipped pistols. We'll see how that goes!